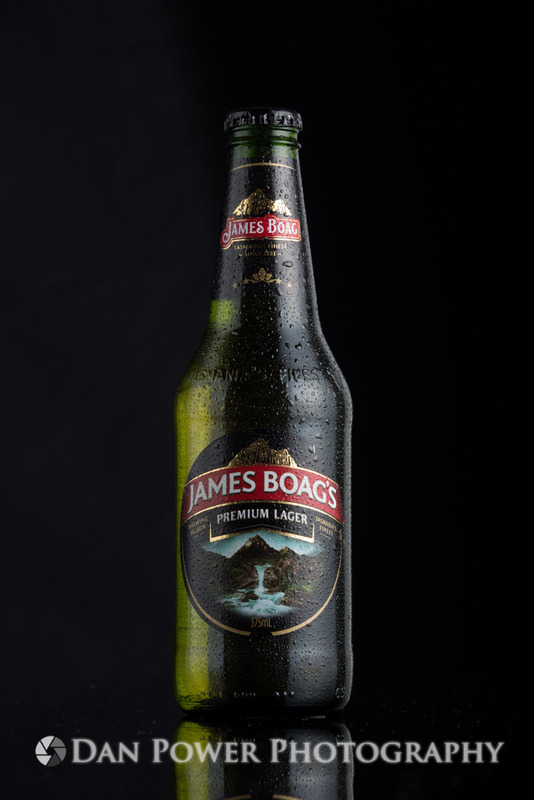 In this instalment of How I Got the Shot, I’ll take a quick look at a product shot of a James Boag’s Premium Lager beer bottle. 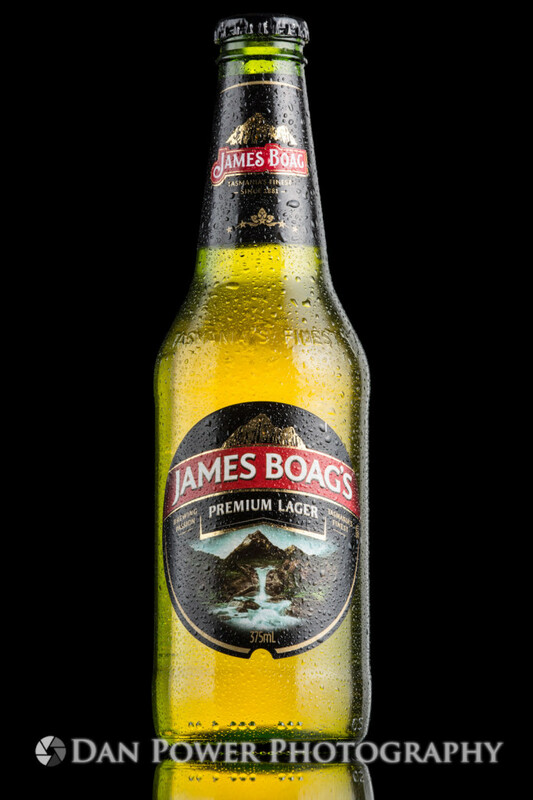 James Boag’s Premium is by farone of my favourite beers, so with plenty of it in the garage it was easy to find the perfect bottle to shoot! I wanted to end up with a very clean and simple product shot – a nice sharp bottle on a solid black background with a small reflection underneath. The reflection can be very easily removed in Photoshop, so I figured it was better to have it and not need it than wish for it later. First things first, the bottle needed to be prepared. This involved removing the painted batch numbers and best before date from above the label with steel wool, and also taking the back label off to allow light from behind the bottle to come through. The bottle was then cleaned with methylated spirits, and sprayed with a glucose and water mix to make the lovely condensation effect that is impossible to reliably create in a studio with a cold bottle. It’s a really handy trick, as once the mixture dries solid the condensation stays there until you wash it off, giving you plenty of time to work on getting your lighting right. Once the bottle was dry I started with a piece of gloss black acrylic as the base surface and a black cotton backdrop, which gave me a solid black background and a nice reflection. 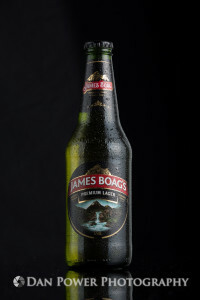 An AlienBee B800 with a small (24″) softbox was placed behind the bottle and slightly off to camera right to create the strong catch light down the right edge, while soft illumination on the left was created using a larger 48″ softbox on an AlienBee B800. For the strong lighting on the right I used an AlienBee B1600 behind a 1200 x 800mm scrim. A scrim is a wooden frame with a layer of tracing paper on each side, and serves to soften the light similar to a softbox but with a different effect. Point a light at the center and it will gradually fade off to the edges, giving a more gradated light rather than the hard edge you’ll get from a softbox. 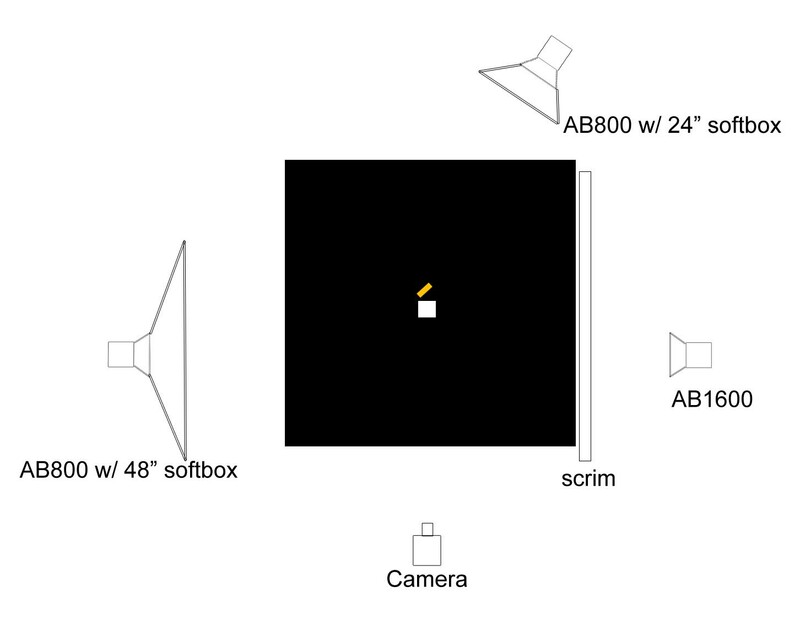 The AlienBees were set as follows: B800 behind 1/4 power, B800 to camera left 1/8 power, and B1600 to camera right 1/4 power. Here’s a VERY quick lighting diagram for reference..
Not too bad, but it’s missing something… there’s no pop in the liquid! It looks dead and dull, and not very appealing.. it certainly doesn’t make me thirsty. So, once happy with the light, the last step was to place a piece of gold reflective card behind the bottle at about a 45 degree angle, facing the scrim. This bounced some beautiful golden light back through the bottle and really brought out the colour of the beer inside. A quick re-frame to take full advantage of every pixel in the Canon 5D Mark III’s sensor and it was time for the final product.